“I was doing everything I ever wanted to do. But then there was something that was missing. I was not able to feel happy anymore,” says Rajshri. 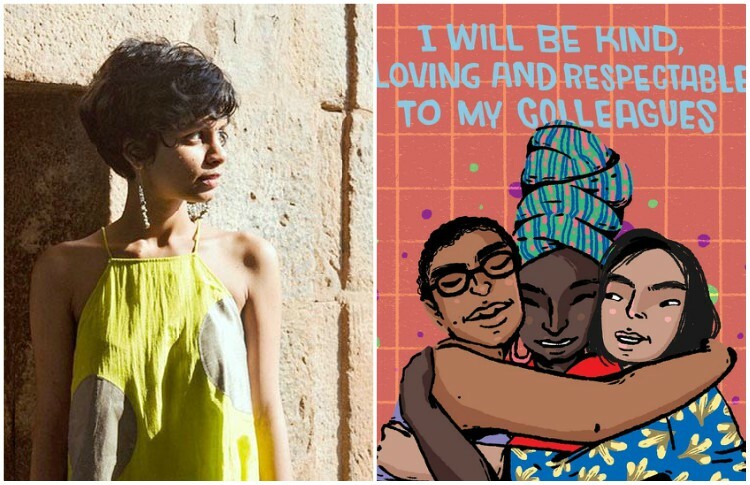 Rajshri Deshpande or as you might know her Lakshmi from Angry Indian Goddesses is a woman who dons many hats. While the actress in her keeps us awed, it is the activist in her that we reached out to. 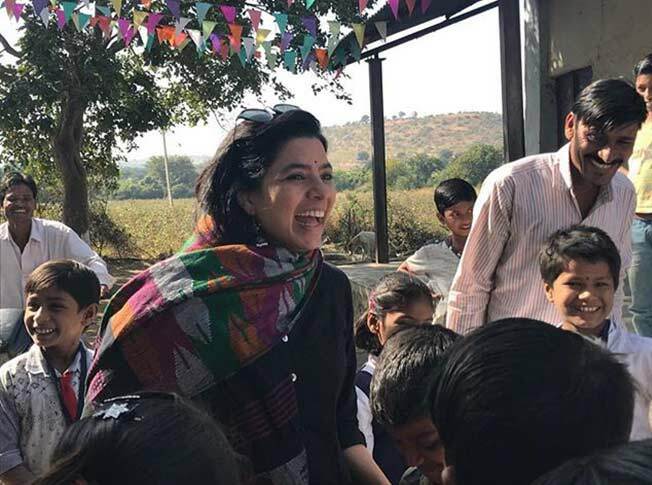 Rajshri has single-handedly managed to transform and empower the drought hit Pandhri village in Maharashtra and has now taken yet another village under her wing. 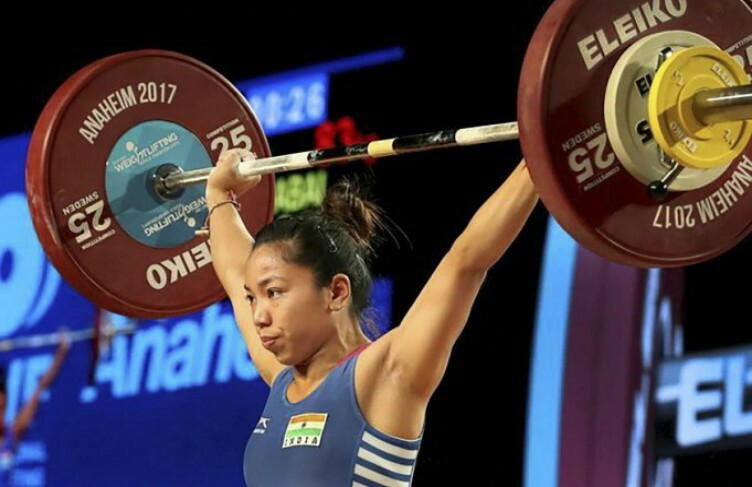 “Pandhri is my elder son and Math Jalgaon is the younger one,” she says. All sorts of nervous before talking to the immensely talented actress I was left awestruck with her humility. When I pointed the same to her, her reply was, “I am nothing yaar. I am a simple person just like you are.” Trust me she means it when she utters those lines and more than that lives it. How did you take up the cause of these villages? How did it all start? It started three years back when I started travelling to Marathwada. I have lived there and I know the region, it’s people and their problems. I drove down to many places in Marathwada including Nanda, Nagpur, Nanded, Beed. 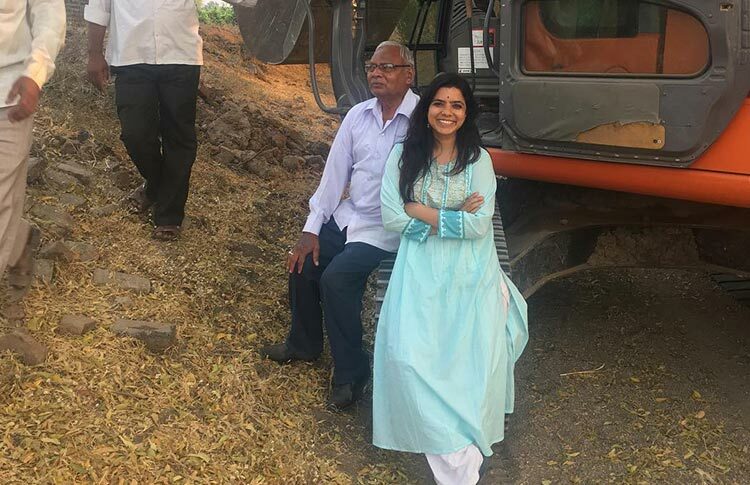 My aim was to find out how the farmers in these areas could be helped. I gathered that there were many small villages in the belt waiting for their turn to be picked up. So I decided to start from the village called Pandhri as I was all alone in my mission. What was the major issue faced by Pandhri? The drought was the major issue and I found out that people were relying on water tankers. I roped in a few environmentalists to learn what needs to be done. I did not want to help them with water tankers. I wanted to give them something permanent. I did not have any money or resources when I started but I certainly had the willpower to bring about a change. Tell us how you went about it? I shared the idea with my friends. Varun Grover gave me his national award money of 1.5 lacks, another friend of mine donated a machine. But I realised that the main task was to get the village together, I did not have any manpower and I wanted the village folks to work for their village. And, how did you get the entire village together? It was very difficult to unite the entire village. I spent days and days talking to them and solving their internal politics and ego clashes. I knew that their love for their village was far more beyond, And, in the end, I had an army of people who had been working day and night for 15 days for the rainwater harvesting as the monsoon almost arrived. What was one drastic change in the life of the village that you witnessed after initiating rainwater harvesting? The farmers have started experimenting with their crops as they now have sufficient water. While earlier they kept themselves confined to safe crops like cotton, they are expanding their horizons by trying out crops like sweat lime, pomegranate, etc. Tell me about the other projects that you have undertaken in the village. We had worked on sanitation. There were no toilets in the village. I assured the villagers that I would get the funds from the government but they would have to make their own toilets. 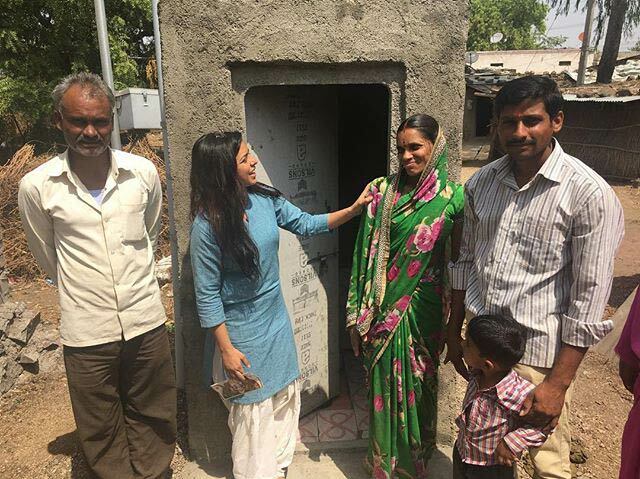 Within 6 months, the village had 200 toilets. They did it from scratch, everything, from the installation of the septic tanks to the plaster, was done by them – and this is what I wanted. Rajshri got the village folks to make their own toilets from the scratch. After the toilets were ready, the need was to inspire them to use them. I got doctors on board to educate them about the need for sanitation. Till now I have worked for two villages, Pandhri and Math Jalgaon. I have successfully managed to raise 5 schools in total, 3 in Math Jalgaon and 2 in Pandhri. 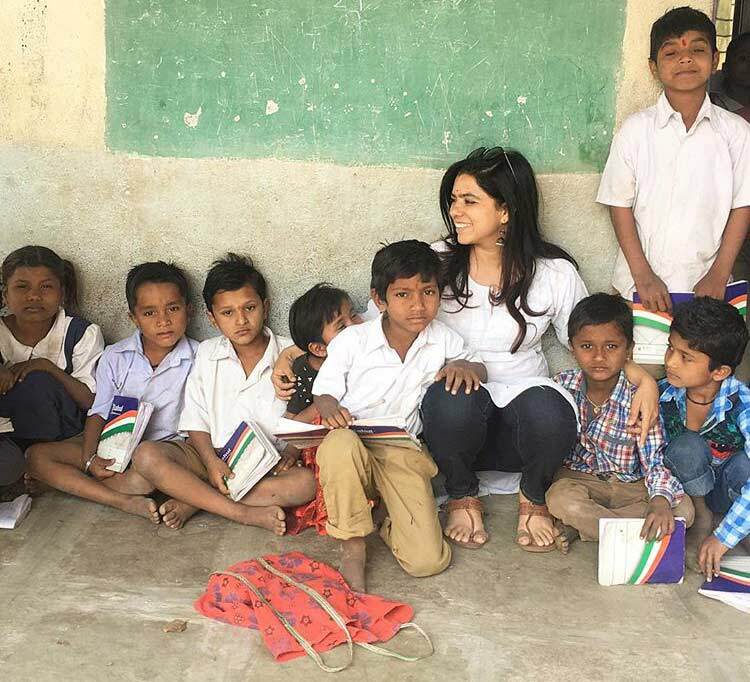 Rajshri has successfully managed to raisen 5 schools in the two villages that she has hitherto worked for. What have you already done for the women’s empowerment in the village? I got a young committee made in the villages and I insisted on the inclusion of women into it. Without women, there are no committee meetings, and no decisions. I make sure that the women actually work. I have allocated them important duties. What are some of the problems faced by women of those areas? Although women in the region are very safe and happy, education remains a major issue. Owing to lack of awareness and education, they don’t really understand the importance of hygiene and sanitation and that has been taking a huge toll on their health. I have started working in that direction as I have been organising health camps in the village and have been distributing sanitary pads. How did it help them out? What changes did you see in the women from the village? They have become way more confident than before. They have even started coming up with their own ideas. You know some of them are now making bags with recycled cloth and the end products are lovely. A restaurateur friend of mine from Bombay recently asked for the bags as he liked them and wanted to use them for his restaurant’s delivery. 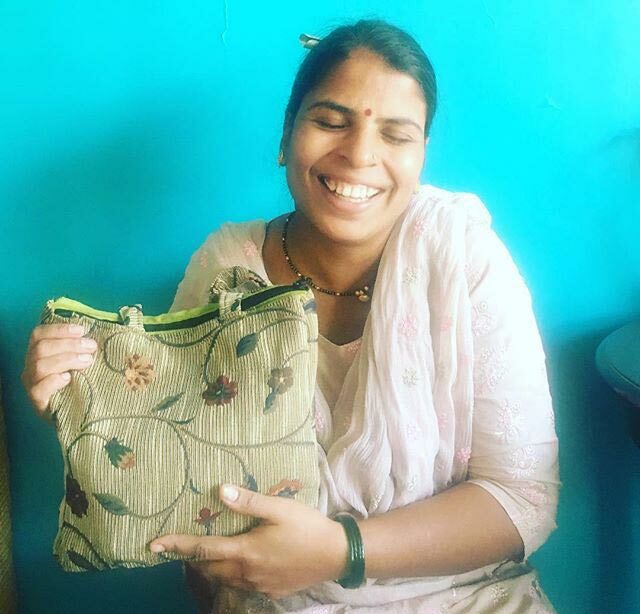 A village woman showing off the bag made by her with recycled cloth. What is your ultimate vision for these villages? I want to empower them to be sustainable and independent. My involvement is as much as of a manager and I want these villagers to do the work for themselves which they are indeed doing. I want to get all of them together. Without there unity, nothing is possible. I want them to realise that no one but they themselves can bring about changes that they are looking for and they don’t need anyone else including me to thrive. How did you get them to open to you and confide in you? It took me a while to gain their trust as they didn’t know who I was, neither were they aware of what my purpose was. Here is a valuable tip, to get their trust you need to be a good listener and I became one. I listened to them to understand their basic issues and started working to find solutions. As they noticed that my intentions were right, they automatically started opening up. How has your work in these villages affected your city lifestyle? Nothing has changed yaar. I was born in a village. I belong to a farming family, this is the lifestyle that I have lived and I looked up to. 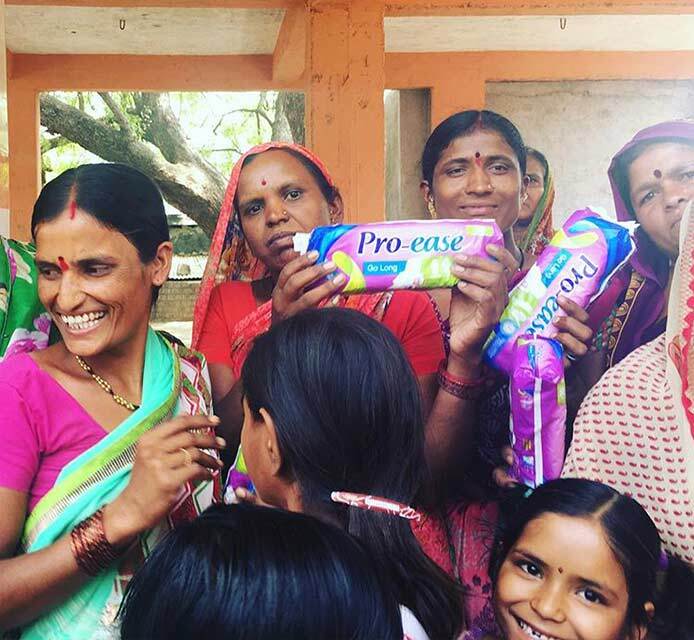 Rajshri has been trying to educate the village women about sanitation and has been distributing sanitary pads in the village. I have started my own organization ‘Nabhangan Foundation’. It works for 2 villages which means almost 5000 farmers. We are still trying to find honest and best people to work with. Our team is growing and we seek support, suggestions, and love. Let’s talk about another community very close to your heart: the transgender community. How did you get connected with the LGBTQ cause? I first had an intimate interaction with them during a project. I had to play a transgender for one of my shows and that is when I met Vicky. My interactions with her introduced me to their internal world and their pains and problems. She is family now. I have recently hired a transgender driver as well, who by the way is Mumbai’s very first driver from the community. 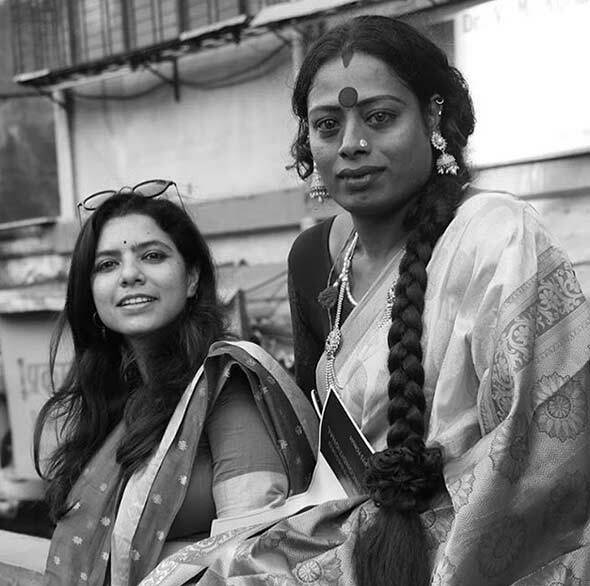 Rajshri has been actively working for the transgender community. Tell me more about your work for the community. It has all just started. Of course, they are all a part of the ‘Nabhangan’ family. 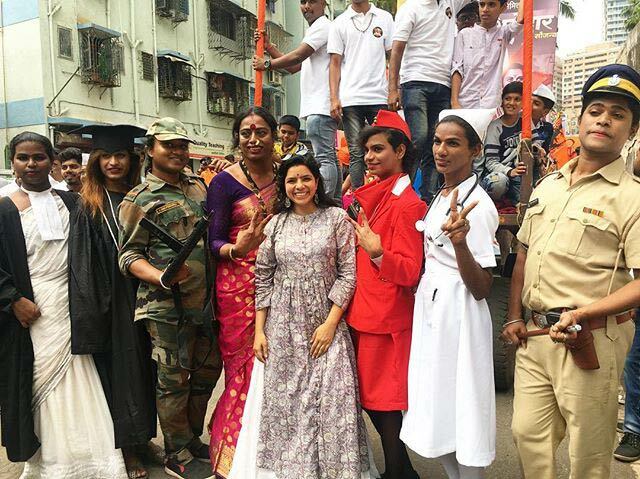 Recently for the Giri padwa parade, we decided to dress them as doctors, air hostesses, police inspectors, nurses, army officers, etc. The aim was to make people see them in a different light, beyond the sights of them dancing, clapping and begging. Education is for everyone, it doesn’t see gender or class, and they just like us – can be anything if provided with the right kind of opportunities. I want to spread the message that with proper training and education they are very well capable of living a balanced and happy life. 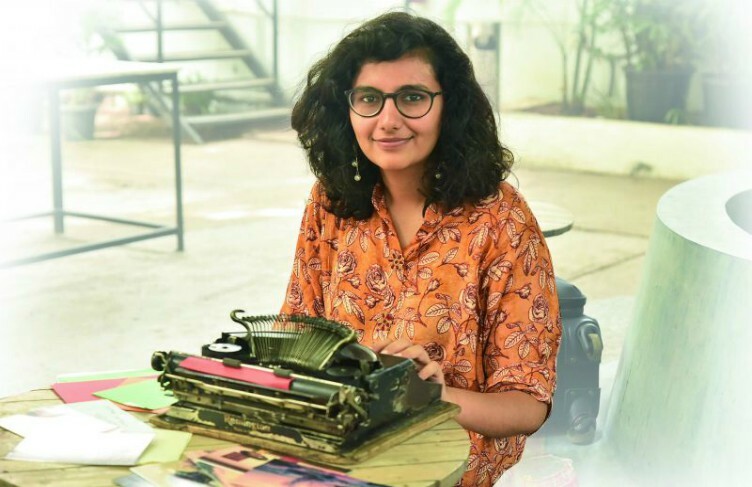 “Education is for everyone, it doesn’t see gender or class, and transgender people just like us can be anything if provided with the right kind of opportunities,” says Rajshri. How does the activist in you compliments the actor in you? Oh, God! Okay, let me try answering that. Acting is what? It is living someone else’s life, right? With these people, I have been experiencing a new facet of life everyday and that is how I have been learning to be a good actor. In a way, you can say that my activism, and my experiences with these myriad hues of people is my riyaaz. 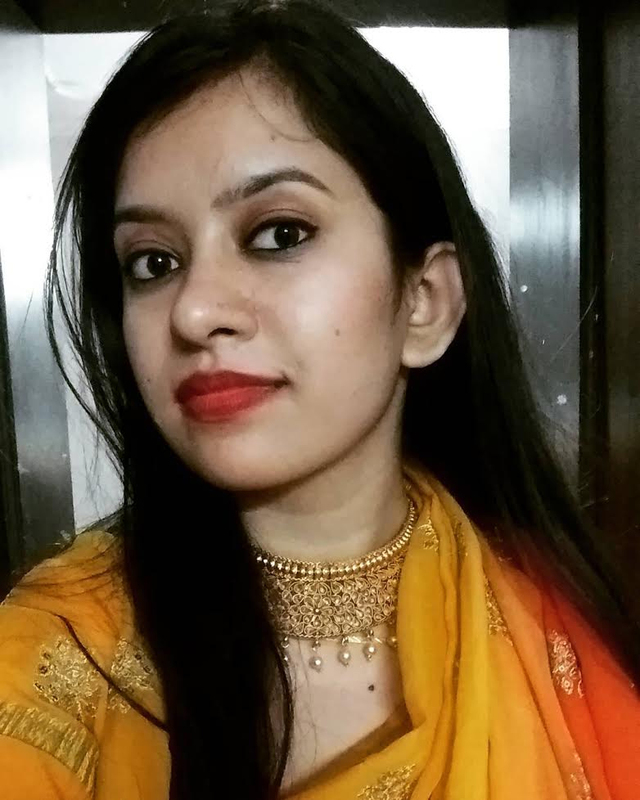 “Being a good human gives you all the strength that you require to face anything in life,” says Rajshri. That reminds me of your movie S Durga finally releasing after all the censorship. With what heart should the audience come and watch your movie? Please support the film. It has faced so many hurdles. In a star driven society, we are trying to do our bit as artists. Please watch the film and support us in making our space in the industry. Even Manto is releasing this year. This is going to be a crazy year.